Got a great idea to make the world a better place? Tell the people at Burton Snowboards about it and you could win $1,000 to make your dream a reality. Visit Burton’s website to learn more! Challenge your friends to DDR & Guitar Hero on our big screen! The 50th annual Grammy Nominations were recently announced at www.grammy.com. Kanye West leads the pack with 8 nominations, and Amy Winehouse has 6. Foo Fighters, Jay-Z, Timbaland, Justin Timberlake, and T-Pain each have 5. Who’s your favorite artist? What is the best song of the year? 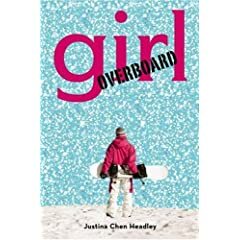 What’s the best book published for teens this year? The purpose of the Printz Award is to honor that book. But how do you choose the BEST book? Is it your favorite book? The one that was the most fun to read? The one with the best writing? How do you know if a book is well-written? I stuggle with questions like these. I’ve read several good books this year that I liked a lot, but there isn’t one that I can say is BETTER than the others. How do YOU pick the best book? Visit icanhascheezburger.com to vote for the funniest cat & animal pictures and even build your own. What’s your favorite lolcat pic? Link to it in the comment box. Register now through December 31! Get together with some friends and form your own Reading Challenge Team. Come up with a great name for your team and sign up at the library! Team members read from a list of 30 books especially picked for 7th and 8th graders, and in April and May compete with the other teams. Come see which team can answer the most questions about the books. All participants are invited to a pizza party on the last night! A limo will pick up the winning team at school and take them to lunch at the restaurant they choose. For more information, call the Youth Services desk at 847-663-6623 or email slempke@nileslibrary.org.